An eruption from a vent southeast of Lēʻahi (Diamond Head) poured dense lava into the sea to build a headland. The Hawaiians called it Kūpikipikiʻō (rough (sea) or agitated (wind or storm)) because of its turbulent waters. The waves attack the headland directly, but the shore on either side of it is protected by a reef. (MacDonald) The black lava that formed there prompted its modern name, Black Point. Based on recommendation of the Secretary of War, on January 18, 1906, President Teddy Roosevelt signed Executive Order 395-A, setting aside public lands at Kūpikipikiʻo Point for military purposes. Fort Ruger Military Reservation was established at Lēʻahi in 1906. The Reservation was named in honor of Major General Thomas H Ruger, who served from 1871 to 1876 as the superintendent of the United States Military Academy at West Point. Battery Mills was built on a 3-acre tract in the Kūpikipikiʻo Point Reservation. Battery Mills was not technically part of Fort Ruger, but was administered by it. The battery was armed with two 5-inch Seacoast guns. There was a reinforced magazine for munitions, a plotting room/command bunker and an underground power room which had a generator. Those guns were later eliminated from the Army’s inventory, so the Battery was decommissioned. The conclusion of World War II and the advent of nuclear and missile warfare made the coastal batteries obsolete. Thus, in December 1955 the majority of the land was turned over to the State of Hawai‘i. Nearby Kaʻalāwai Beach lies at the base of Diamond Head’s eastern slope, between Kuilei Cliff Beach Park (“lei stringing”) to the west and Black Point to the east. Kaʻalāwai (“the watery rock”) is a narrow, white-sand beach with a shallow reef offshore, which makes for generally poor swimming conditions. There are only a few scattered pockets of sand on the nearshore ocean bottom. Freshwater bubbles up between the rocks of the reef. The beach is mainly used by surfers, who paddle out to the surf spot called Brown’s, which is located just behind the reef. An old Beach Road fronted the Kaʻalāwai oceanfront properties. In 1959, owners of the abutting properties claimed the ownership of the old beach road; after a series of lawsuits, many of them obtained declaratory judgments which allowed them to buy the road right-of-way. At the east end of the beach near Black Point is Shangri-La, a mansion turned museum, built by Doris Duke, the daughter of James Buchanan Duke, the founder of the American Tobacco Company, and her husband, James Cromwell, in 1937. In the late 1930s, Doris Duke built her Honolulu home, Shangri La, on 5-acres overlooking the Pacific Ocean and Diamond Head. Shangri La incorporates architectural features from the Islamic world and houses Duke’s extensive collection of Islamic art, which she assembled for nearly 60 years. Today, Shangri La is open for guided, small group tours and educational programs. In partnership with the Doris Duke Foundation for Islamic Art – which owns and supports Shangri La – the Honolulu Museum of Art serves as the orientation center for Shangri La tours. To get to Kaʻalāwai Beach and Cromwell’s Cove take Diamond Head Road east and turn right on Kulamanu Street and park curbside. The beach access is at the end of Kulamanu Place. A later building boom by the wealthy turned Black Point into one of the world’s most exclusive and expensive community. 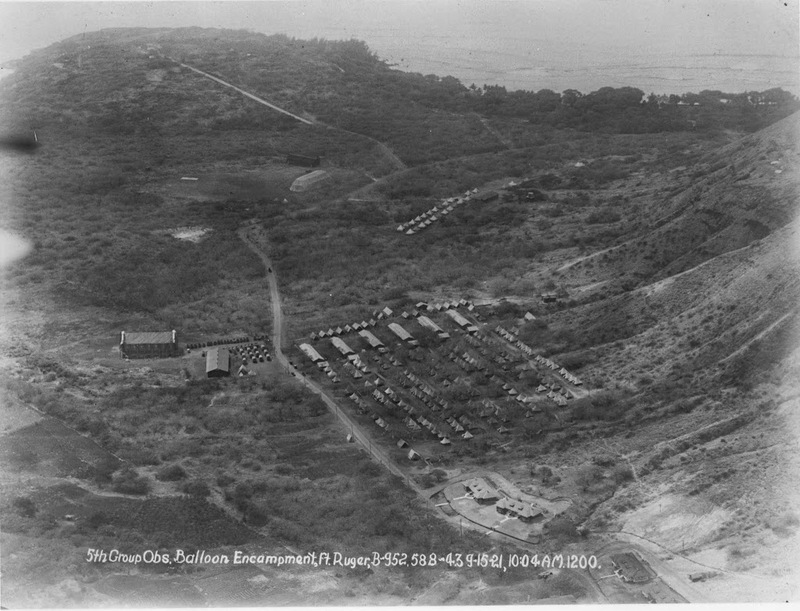 The image shows a 1921 military encampment for a balloon squadron, overlooking Kūpikipikiʻo. In addition, I have included other images in a folder of like name in the Photos section on my Facebook and Google+ pages.